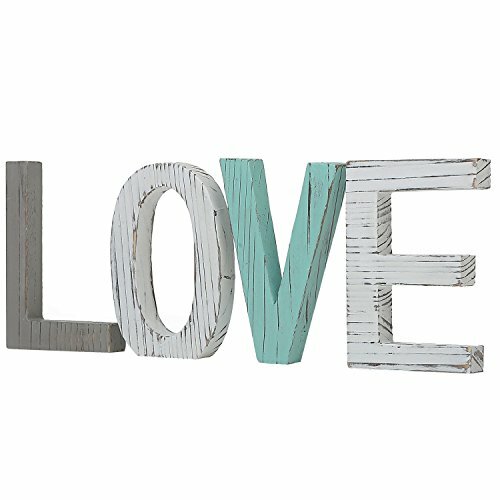 Welcoming everyone with an uplifting message, this wooden "LOVE" sign in individual block letters is the perfect accent for creating a warm atmosphere in the home. The distressed finish adds a charming antique look to add to the timeless appeal of the sign's simple message, and the multicolor design lends a fun salvaged flair. The freestanding letters can be spaced and arranged in any fashion, whether on a counter, shelf, or on top of a kitchen cabinet. Let friends and family feel the love with this rustic reminder of what home is all about. Approximate Dimensions (in inches): 5.9 H x 16.9 W x 0.8 D.
View More In Decorative Signs.